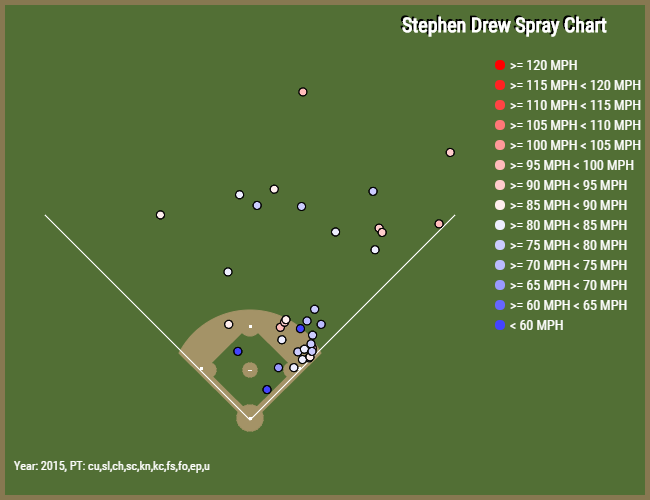 Stephen Drew has had himself a pretty bizarre career so far. The 32-year-old shortstop has been everything from a rising star to a complete liability and one season rarely seems to be predictive of the next. Drew has posted a negative WAR in three separate seasons with at least 300 plate appearances accumulated (2007, 2012, 2014) and he’s also posted a WAR of three or more twice (2010, 2013). Between 2008 and 2011 Drew’s 10.5 WAR ranked 11th among shortstops, but he was below replacement level in the years before and after that span. There’s usually no telling what he’s going to do, and coming into this season he was very difficult to project. On one hand, in 2014 he looked truly broken. Signing late with the Red Sox (in what will go down as one of Scott Boras’s all-time biggest blunders) and moving over to the Yankees later in the year he failed to find his footing and put up an dreadful .162/.237/.299 line on the year. Things got so bad that after the season FanGraphs’ Jeff Sullivan actually penned a piece entitled “Did Stephen Drew Ever Look Like A Major-League Hitter?” about his 2014 season. Despite his putrid display, the Yankees figured that he wasn’t done yet and signed him to one-year contract worth $5 million that included playing time incentives. At the time the logic was pretty sound. Drew was only entering his age-32 season and as recently as 2013 he had been a real asset for the Red Sox posting a WAR total of 3.4. He had a history of bouncing back from bad results, he was healthy, not too old and didn’t cost much. Unfortunately for the Yankees it has not looked like a good signing so far. Drew has shown some pop, but other than that he has not been worth even his modest salary. His -0.1 WAR is ugly, so too is his .178/.239/372 line and 66 wRC+. His BABIP has some room to rebound, but it was also incredibly low last year so it’s coming time to ask whether his hitting ability still warrants the expectation that he’s going to post a normal BABIP. So why has his hitting been so poor over since his last productive season in 2013? One reason has been a shocking inability to hit anything but fastballs. Drew has always been a fastball hitter, and his ability to hit what Brooks Baseball classifies as “Hard” Pitches actually hasn’t deserted him despite his awful offensive output. Where he has totally gone off the rails is trying to hit anything else. Surely the BABIPs are too low to hold up, but even in a small sample these numbers are indicative of a player who is unable to square up anything on the slower side. This idea is supported by his exit velocity on non-fastballs. While there’s a chance he’s been a bit on the unlikely side with these balls in play, the reality is he isn’t hitting them hard enough to expect to get hits with any kind of regularity. Right now Drew is a pretty awful hitter and one of the biggest reasons is that he can only hit fastballs with authority. Sometimes pitchers can survive with a single plus pitch, but only being able to drive one well doesn’t work because you don’t get to choose what pitchers throw your way. In Drew’s case he’s still seeing 56.4 percent fastballs, less than two percent below his career average (58.1 percent). In the near future one would have to think that number is going to drop. If pitchers want to turn Drew into even more of an automatic out than he is at the moment, it definitely should. 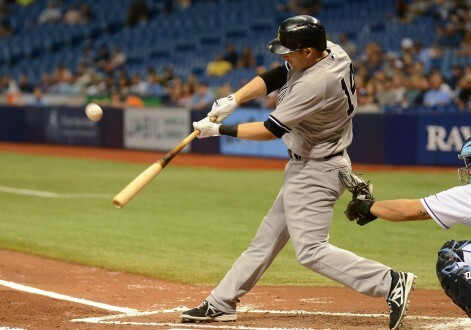 How do you hit Dellin Betances?